The whole world knows about the phenomenon which swept the planet in the early 1960s, when a group of mop-topped, trendily-suited and smartly-shod young Merseyside lads got together to play their own brand of music, stormed up the world's charts and changed the face of popular music forever. The story of what happened to those four lads has passed into legend and is, in all probability, well documented elsewhere. Perhaps a little less well known - at least, outside the West of England - but every bit as fascinating, is the story of a bunch of haystack-headed, cider-soaked and dung-booted, not-quite-so-young Avonside lads who started a style of music and humour which turned out to be just as big (at least in Zummerzet!) 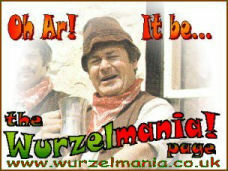 and much longer lasting...Wurzelmania! The story of how Adge Cutler - also known as the Bard of Avonmouth- now legendary as the finest poet in Zummerzet's history, approached agent and manager John Miles in June 1966 "stoney broke but for some songs he had written", and how the idea of Adge Cutler & The Wurzels was born at that historic meeting, has passed into North Somerset folklore. This page continues the story of the Farmyard Four from the beet group of those early days, through the heady days of Cyderdelia and the so-called Summer of Scrumpy, right up to the present time... well, up to last Saturday anyway. Little did EMI record producer Bob Barratt know what he was starting all those years ago on the historic day of 2nd November 1966 when, clutching a pint of finest rough cider, he groped his way carefully through the smoke-filled atmosphere and clambered up onto the straw-strewn stage in front of the assembled crowd of cider drinkers and bemused farm animals at the Royal Oak pub, Nailsea, in the English county of Somerset, and uttered the slurred but immortal words: "Ladies and Gentlemen, Present Cider Mugs, for the Pride of Priddy...ADGE CUTLER AND THE WURZELS!" When the applause died down, the atmosphere was acoustic and charged with scrumpy fumes as Adge took the microphone, pronounced the now legendary words "Is it rolling, Bob?" and launched into the first number - a number which was to change the face of popular music in North Zummerzet forever - Twice Daily. As he sweated, grunted and gyrated as only a hardened cider drinker can, with the simple but effective accompaniment of his ace guitarist Reg "Snake 'ips" Quantrill and double bass player John Macey, the assembled audience realised that here was something special and that they were in the presence of a historic event. For this was the birth of a new sound unlike anything heard before - a sound that was to become known as Scrumpy and Western music. News of the latest phenomenon spread like a fire in a hayloft, and such was the reaction and the local demand to hear the revolutionary new style of music that EMI rush-released a double 'A' sided single Twice Daily / Drink Up Thy Zider. It immediately shot to the top of the charts in Bristol and Somerset, and soon afterwards reached number 45 in the UK national charts, in a rare UK occurrence of a "regional breakout", a phenomenon hitherto only known in the USA. If success for the record was only a matter of time, it was guaranteed when the prim 'Auntie' BBC of the 1960s decided unilaterally that the words of Twice Daily would offend the sensitive ears of their listeners. However, the BBC's Light Programme was inundated with requests for Drink Up Thy Zider on such programmes as Two Way Family Favourites, Housewives' Choice, Children's Favourites, Workers' Playtime, Womens' Hour, Listen With Mother and even Gardeners' Question Time, forcing them to give the track enough airplay to push the record into the "hit parade" (as the charts of the day were known). This was in spite of the BBC 'gramophone recording announcers' (DJs) being ordered on pain of dismissal to only play the record from the waist up. From the heady early days as the Farmyard Four, with the West Country in the grip of the Wurzelmania phenomenon, through the Summer of Scrumpy and its attendant Cyderdelic sounds of the late 1960s, up to the present day as the grand old masters of Scrumpy and Western, this page pays homage to those men without whom West Country cider drinkers would be destined forever to sing The Blaydon Races, I Belong To Glasgow and Maybe It's Because I'm A Londoner. This is their story. Well, some of it, anyhow.